Bull sharks can live in freshwater. Most people associate sharks with saltwater and the oceans, and rightly so. However, while saltwater environments are certainly where the great majority of shark species can be found, this is not to say that they are completely unable to survive in freshwater environments as well. In the United States alone, sharks have been spotted in the Mississippi river as far north as Illinois, as well as in the ocean-connected rivers that are so prevalent throughout South Florida and the Everglades. This is not to say that you will find just any species of shark making its way into the world’s freshwater rivers. 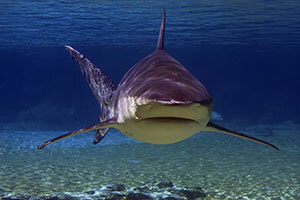 In fact, there is one shark in particular who seems to be found in these areas more than any other – the bull shark. Furthermore, this fact can be particularly scary when you consider that bull sharks are responsible for more human deaths than any other species of shark in the world. Not only must swimmers be wary of alligators when entering a Florida river, but if said river is also connected to the ocean, swimmers must also be careful to avoid bull sharks as well. Scientists are still not entirely sure what makes this special characteristic almost exclusive to this single species of shark. All species of sharks must maintain a certain concentration of salt within their bodies, as salt prevents their cells from rupturing which in turn causes bloating and death. As soon as a shark enters freshwater, the salt concentration within their body becomes diluted, which is why the great majority of sharks will never even enter freshwater at all, or if they do, will leave it almost immediately. The fact that bull sharks can live in freshwater is not because they do not possess the same need to maintain a certain salinity level as other sharks. Bull sharks still need to maintain their salinity levels, but have developed a special ability within their kidneys to continuously recycle and retain the salt that they absorb. And while it is not yet known how or why they developed this ability, it does seem to give them a competitive advantage when it comes to feeding and breeding, allowing them exclusive access to certain prey as well as a safe haven for newborns. However, because freshwater environments still do not appear to be preferable for bull sharks, it is clear that the disadvantages of such environments still outweigh the advantages. For your chance to see two of planet earth’s most fearsome predators in the same environment – alligators and sharks – take an airboat ride through the Everglades today. Not only are airboat tours a safe way to observe these wild animals from a comfortable distance, but they are a great way to explore everything else that the Everglades has to offer as well.